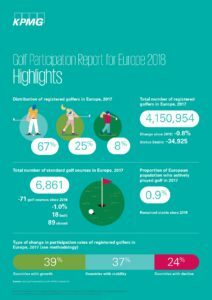 Please find attached the press release on KPMG’s Golf Participation Report for Europe 2018, which was launched today. I have also attached the full report for your convenience, which is available for complimentary download on www.golfbenchmark.com. © 2018 KPMG Advisory Ltd., a Hungarian limited liability company and a member firm of the KPMG network of independent member firms affiliated with KPMG International Cooperative (KPMG International), a Swiss entity. All rights reserved.